Give Opportunity and your donation will be doubled up to $30,000! Ready for Thanksgiving dinner: Thank you donors and volunteers! With each newsletter, we share new stories of accomplishment and success for our clients. For this November edition, we wanted to share updates on some of our favorite stories. 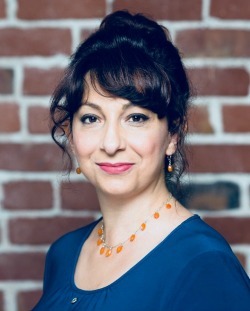 Rana Zarour, January 2015: Rana's first job after she completed the Job Training and Placement Program was as a part-time Operations Assistant with the East Bay Community Foundation. 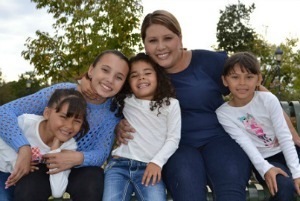 More than four years later, she has been promoted three times and is making twice her starting pay as the Operations Coordinator with East Bay Community Foundation. Joanna Thieme, November 2015: Our story with Joanna left off just as she was made permanent in her position with Contra Costa County. 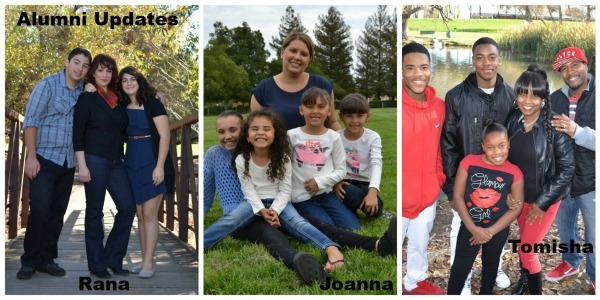 Two promotions later and now an Eligibility Worker III, Joanna is still helping others access the resources that were so important for her own success. Tomisha Harts (Brent), January 2018: Tomisha loved her first position after completing the training program, but the commute from Pittsburg to El Cerrito was getting hard to manage. After working with our alumni program to find a new position, she landed an administrative role with Dow Chemical in Pittsburg. With each newsletter, we share new stories of accomplishment and success for our clients. For this November edition, we wanted to share updates on some of our most popular stories. Rana Zarour, January 2015: Rana's first job after she completed the Job Training and Placement Program was as a part-time Operations Assistant with the East Bay Community Foundation. More than four years later, she has been promoted three times and is now making twice her starting pay serving as the Operations Coordinator for East Bay Community Foundation. "I have gained so much in this position. Although I started in a part-time position, I remained open to opportunities and always said yes to new challenges. The Foundation has supported my growth, and I have gained more responsibilities with each challenge," shares Rana. "My advice to other new alumni would be to take a risk and give it your all. When I took the job at East Bay Community Foundation, I didn't think it would end up being such a career opportunity. Pay attention to every detail, even the small ones, and let your employer know you care. OJ gave me the chance to gain new skills and to polish the ones I already had. I am thankful they helped me develop the skills to grow to where I am now. I still feel advanced and highly competent in my computer skills. Those skills plus the professional skills I learned and practiced at OJ continue to give me the confidence that I need to excel in my daily work each day." "My advice for new graduates would be to stick it out through the hard times," shares Joanna. "My journey has not always been easy. Embrace the bumps in the road; embrace the battles. That's how I look back at those hardest times in my life now. All those struggles seemed so big. Now looking back, they were all just something I had to go through. I am so appreciative of OJ because I wouldn't be where I am without the training. I had to put in the work, but they were there for the push and the helping hand for all of those things I couldn't do alone." Tomisha Harts (Brent), January 2018: Tomisha loved her first position after completing the training program, but the commute from Pittsburg to El Cerrrito was getting hard to manage. After working with our alumni program to find a new position, she landed an administrative role with Dow Chemical in Pittsburg. "I am thankful that OJ was still there for me when I was looking for a better position. I knew I had them in my corner during the challenge of finding a new job. I have been an Administrative Professional with Dow Chemical for two months, and I love it! Every day is a new challenge and the work is hard, but I am learning something new every day." Our Holiday Campaign "Give Opportunity" kicks off with #GivingTuesday on November 27th and runs through the end of the year. Give Opportunity and your donation will be doubled up to $30,000! We launch our Giving Tuesday online campaign on November 27, but there's no need to wait. The Delta Scrap & Salvage will match your gift now, dollar for dollar, through December 31! And, this year we've added Career Counseling and Placement Assistance in Antioch and have begun a partnership that will support job seekers for healthcare careers. This means lasting improvement in people's lives, including intangible effects we can't begin to measure. What we can measure is the more than $56 million dollars our alumni have earned since our founding in 2000. There's a lot more work to do to help our low-income neighbors - get involved and donate now! Ondina learned computer skills as part of our job training program, and now she works as an Administrative Assistant at Terence J. O'Sullivan Laborers Training Center. 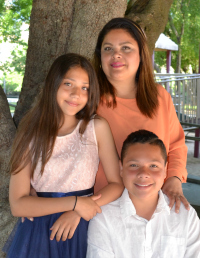 "Opportunity Junction was there to pick me up in ways I could never imagine. They built my confidence and gave me skills, and I am taking the next steps I need to learn and grow to be the professional and mother I know I can be. I had to grow and shed the old parts of myself to make room for the new growth nurtured through the program. My confidence soared and my skills blossomed." The matching grant from Delta Scrap and Salvage will support motivated job seekers like Ondina. Thanksgiving can be a challenging time for families who struggle to make ends meet, and many of our participants experience this added stress during the holidays. 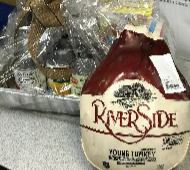 Every November, thanks to donors and volunteers, we have a tradition to provide our participants a Thanksgiving Basket full of ingredients and a turkey to help make their lives a little easier for Thanksgiving. A special thanks to Supervisor Federal Glover's office for donating 50 turkeys for our participants! The turkeys didn't go home alone! Volunteers and donors worked together to produce 50 beautiful baskets containing everything needed to complete the Thanksgiving feast. 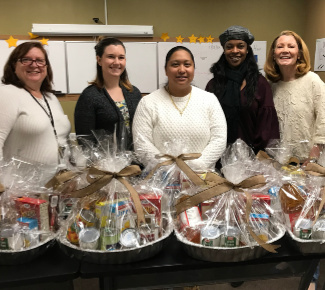 Employer Partner Educational Testing Service (ETS) hosted a Thanksgiving Basket Drive in their Concord office to collect donations and food items throughout the month. They collected enough food to fill 27 baskets. 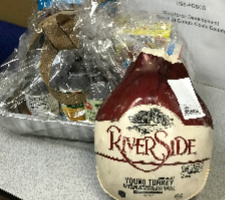 One ETS employee shares, "Participating in the Thanksgiving Basket drive for Opportunity Junction has become something that I look forward to doing every year since I have been with ETS. It gives me a sense of family when I can put a simple smile on a person's face knowing it's being done genuinely out of the kindness of my heart. This gives me the experience of giving back to the community and helps to make a difference with people in my community during the holidays." Longtime donor and volunteer for this event, Sue George says, "Making the Thanksgiving baskets is absolutely my favorite thing to do for the holidays. It's something tangible that I can do for the people that are working so hard to improve their lives. It's an absolute joy." The participants who receive these baskets have expressed joy and gratitude that they can provide for their family and friends on this special day. Thanksgiving is a season for gratitude, and we are so grateful to have incredible supporters. Our participants will have a complete Thanksgiving dinner, thanks to you! Los Medanos College student Destinea Tucker is on track to graduate next fall, earning her Associate's degree and a welding certificate. It hasn't been easy for Destinea. Her Opportunity Junction college counselor Dionne Moeller will tell you that she has seen a transformation in Destinea over the time they have worked together. At its heart, Opportunity Junction's Road Map to College program is about transforming the future for young adults like Destinea, one student at a time. Through a unique partnership with Los Medanos College, Road Map helps students start along the path to pursuing their college dreams, whether earning an Associate's degree, a technical certification, or transferring to a four-year college. Road Map serves the most vulnerable young adults, ages 18 to 24, many of whom have not even dared to dream about college. Our students include foster youth, pregnant or parenting youth, those with disabilities, those involved with the justice system--young adults wanting to stabilize lives that have been defined by loss and struggle. 70% of those we serve are unemployed and not in school when they come to us. Destinea faces many challenges as she strives to successfully complete college: losing her mother to cancer shortly before starting school, lack of family support, in and out of homelessness and foster care, and scarce financial resources. Road Map's two college and career counselors give students one year of individualized, intensive support, aimed at helping them stabilize their lives as well as realizing their education and employment goals. This intensive year of support aims to help students persist into their third semester; data shows that students who persist into the third semester are more likely to complete their schooling. Destinea has fully utilized the supports offered to Road Map students. While her counselor Dionne has been there for her at every step along the way, Destinea has learned to trust. She's learned how to ask for help, how to talk to professors, transforming from withdrawn to open and animated. In October at their second annual Community Celebration event, over 100 members of Impact 100 East Bay voted to award Road Map to College their highly competitive annual award that totaled a remarkable $103,000! Impact 100 East Bay's mission is to unite women in the community in a common cause, collectively raising funds to support unmet needs in Contra Costa and Alameda counties and distributing transformational grants. That evening, after each of three finalist organizations gave 10 minute presentations to the group, members voted--and Road Map to College was the winner! Standing with her counselor Dionne on the podium, Destinea courageously shared her story, both struggles and dreams, with the crowd, inspiring and moving them to tears of admiration. Thanks to Destinea for bringing to life the heart of Road Map to College. Educational Testing Service (ETS): ETS renewed its support for Opportunity Junction through a grant to help Road Map to College students in the form of books, tools, uniforms, and other unmet financial needs. The mission of nonprofit ETS is to advance quality and equity in education for all people worldwide. Impact 100 East Bay: At their second annual Community Celebration event, Impact 100 East Bay members voted to award Opportunity Junction's Road Map to College program their highly competitive annual award. Impact 100 East Bay's mission is to unite women in the community in a common cause, collectively raising funds to support unmet needs in Contra Costa and Alameda counties. Each member makes an annual donation of $1,000, 100% of which is distributed in transformational grants. John Muir Community Health Fund: John Muir Community Health Fund approved a grant for Opportunity Junction, in partnership with Ombudsman Services of Contra Costa & Solano and Mount Diablo Adult Education, to launch the Health Career Pathway initiative to create a regional response to significant allied health professional staffing and quality improvement needs for those delivering care (to uninsured, underinsured, underserved and vulnerable Contra Costa residents most at-risk for poor health), while providing a pathway towards economic sufficiency for low-income individuals. Look for information about the new Certified Nursing Assistant (CNA) technical certification program coming in 2019. Keller Canyon Landfill Mitigation Fund: Opportunity Junction is proud to have been awarded a grant from the County's Keller Canyon Mitigation Fund to support Bay Point and Pittsburg residents participating in our Job Training and Placement Program. Supervisor Federal Glover leads the board that administers the funding to support a wide range of programs affecting quality of life for residents in the vicinity of the Keller Canyon Landfill, including public safety, youth development, and community beautification. Safeway and Chevron: We recently received a grant from the Safeway Foundation and Chevron in conjunction with the 2018 Safeway Open Golf Tournament presented by Chevron. The grant will support the Job Training and Placement Program, our Career Counseling and Placement Services, and Road Map to College. Share the Spirit: We have been awarded a Share the Spirit grant to support our annual Alumni Holiday Party, spreading holiday cheer through celebration, as well as toys for children and gift cards for families to purchase food. Share the Spirit is a partnership of the Bay Area News Group - East Bay Times and the Contra Costa Crisis Center. 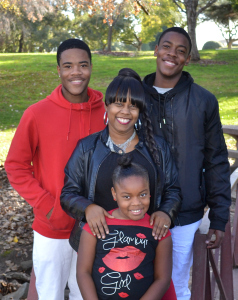 Keep an eye out for a story in the East Bay Times highlighting an Opportunity Junction alum! 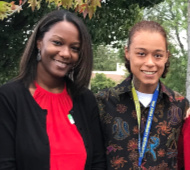 SparkPoint Funders: The local and regional funders of SparkPoint Contra Costa have renewed their support for the collaborative, with a portion of that funding directed to support our two career counselors at SparkPoint Contra Costa in Bay Point. 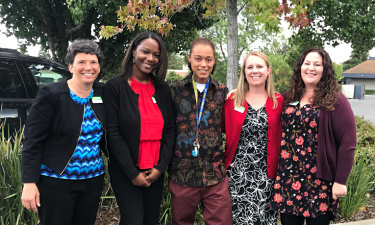 The United Way of the Bay Area serves as a fundraiser and pass-through for the SparkPoints, and the Richmond Community Foundation serves as the fiscal agent and a co-lead agency for SparkPoint Contra Costa. Behind the scenes, Chevron is the largest supporter of SparkPoint Contra Costa. Tipping Point Community: Tipping Point Community renewed Opportunity Junction’s annual core operating grant. Tipping Point screens non-profits rigorously to find, fund, and partner with the most effective groups working to educate, employ, house, and support those in needs, investing in a diverse portfolio working across four issue areas in six counties. United Way of the Bay Area: The United Way of the Bay Area has once again awarded a grant support and partnership in the Earn It! Keep It! Save It! Coalition of Do-It-Yourself Tax Assistance Program. Taxpayers can eFile their returns for free (income limit has not yet been announced, but last year’s income limit was $66,000.) Sessions at Opportunity Junction will be offered Friday evenings and Saturday mornings starting in January and running through April.